The very name conjures up intruge and something a little different. The day we stumbled upon Rattle Gill, my daughter and husband were famished - we were already late for lunch. But sticky tables and utilitarian cafes are not for me and they knew better than try to persuade me into anywhere serving pre-packed sandwiches in cellophane. We were soon rewarded by a sign on the pavement, to Rattle Gill Cafe. We peered up the ginnel with interest...and well yes ... hunger... the sound of the river Stock Ghyll in full flow from recent rains, only just deafening out our rumbling tums! 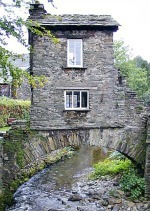 The sign outside Rattle Gill was hand-written - my daughter and husband relaxed confident that we could eat here. Daily specials are one of my weaknesses...I really do dread laminated menus along with cellophane wrapped sandwiches. 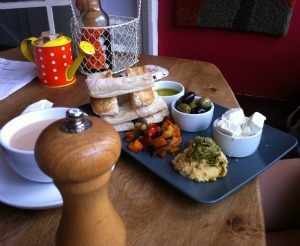 Due to our incredibly late arrival the Veggie chilli had run out - but we were not to be put off. We opted for the bowl of soup served with aged cheddar and a lovely hunk of bread and also the home made mezze off the specials board - it was exactly what we were after. Though peeping through the counter we spotted some substantial looking home made cakes and scones, tempting us to skip the savoury and launch straight in at pudding! After some while my daughter concluded 'is this a vegetarian cafe?' Until that point I hadn't noticed as there was such a choice of scrummy sounding food ... however had my son been with us that day, who is, shall we say, at the carnivore end of the eating spectrum, then we may have had to look further afield. Though I love him dearly I was glad for that hour that he was elsewhere, so that we could enjoy the vegetarian delights from the Rattle Gill kitchen. 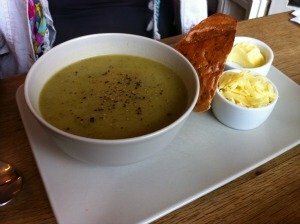 Rattle Gill is a vegetarian cafe in the Lake District and is currently open 10 - 5pm (except Tuesdays & Wednesdays) - but why not double check the timings on their website.